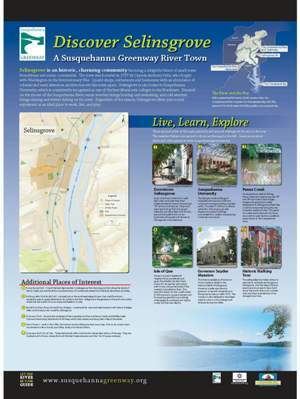 Selinsgrove is an historic community featuring a delightful blend of small-town friendliness and scenic countryside. Quaint shops, restaurants and businesses with an abundance of colonial and early American architecture set this town apart. Selinsgrove is also home to Susquehanna University, which is consistently recognized as one of the best liberal arts colleges in the Northeast. Situated on the shores of the Susquehanna River, warm weather brings boating and swimming, and cold weather brings skating and winter fishing on the river. Regardless of the season, Selinsgrove offers year-round enjoyment as an ideal place to work, live, and play. Enjoy "small town America" on well-kept, clean and quiet tree-lined streets flanked by historic colonial and 19th century architecture. Shops and restaraunts along the brick-paved sidewalks provide a feast both for the eye and the palatte that can be explored and enjoyed with leisure at Selinsgrove's unhurried pace. The Georgian style buildings of Susquehanna's spacious 306 acre campus sit amongst winding, wooded paths. Founded in 1858 as a Lutheran institution, the campus proudly displays its original buildings surrounded by a modern and growing University community. An exceptional creek for fishing, Penn's Creek was used during the 18th and 19th centuries to float barges loaded with goods from valley settlements to Selinsgrove where they could be transported along the river to eastern seaboard cities. This jewel of a creek awaits discovery for those who walk its quiet banks or paddle its waters down to the Susquehanna River. Home to a quaint residential neighborhood, woodlands and agricultural fields, the Isle is best known for having the most scenic walk in town along the banks of the majestic Susquehanna River. This beautiful stretch of river is well suited for fishing boats, canoes and kayaks, and for enjoying peaceful surroundings while eagles fly overhead and mighty musky lurk the river depths. This historic residence of Governor Simon Snyder is listed on the Historical Walk of Selinsgrove. Governor Snyder was the only governor to serve for three terms in Pennsylvania history (1808-1817). The mansion is also believed to have been used as a stop on the Underground Railroad during the 1800s. This self-guided tour takes visitors to see historic architecture throughout Selinsgrove. Visit the sites of historic events and structures to learn both about the town's history as a market and canal town and see how it has changed over time.